I took this image yesterday after returning from Deering Estates I went to the hardware store for some thing. This Church is behind the Bacardi Bldg one three favorite churches off of Biscayne Blvd. Ive photographed it several times over the past 5 years. 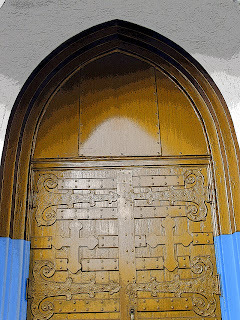 the doors caught my attention this time.This morning I cropped this image ,posterized it Tweaked it and the poster edged it I usually want to my shots past photo but stop here.I did double it up for something i could possibly use my slavery theme.